QUEBEC CITY, CANADA, Sept 25, 2013 — EXFO Inc. (NASDAQ: EXFO) (TSX: EXF) today announced two new products, the FTB-5230S Optical Spectrum Analyzer (OSA), an entry-level OSA suitable for a variety of field applications, and the FTB-5230S-OCA Optical Channel Analyzer (OCA), optimized for power and wavelength measurements. For many CWDM, DWDM and hybrid networks, simple channel checkers are too limiting, whereas full-fledged OSAs often deliver many advanced and features and capabilities, but these sophisticated solutions come at a higher price. Based on key market feedback, EXFO has responded by launching two tier-1 entry-level products that offer great ease of use. The FTB‑5230S OSA meets the needs of a variety of turn-up and commissioning applications by delivering power and wavelength measurements, in addition to system critical OSNR testing in accordance with IEC 61280-2-9 (interpolation method). The FTB-5230S OSA can also handle up to 23 dBm per channel, making it an ideal solution for modern cable operator networks. 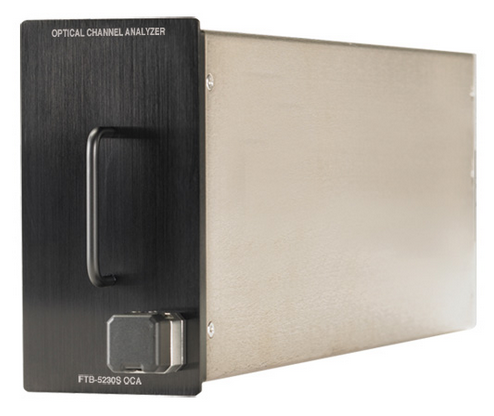 In addition to the FTB-5230S, EXFO has launched the FTB-5230S-OCA, an attractive compromise between an OSA and a channel analyzer. Integrating the best of both solution types, this tool offers power and central wavelength measurements, along with high-power measurements up to 23 dBm per channel, at the value of an advanced channel analyzer. Designed for maximum simplicity in the field, this OCA keeps settings to a bare minimum. The FTB-5230S-OCA has also been optimized for a number of multiwavelength applications (DWDM, CWDM, DWDM over CWDM, and CFP power measurements), and can be seamlessly upgraded in the field to an FTB-5230S OSA via software key. Because CFPs have longer reaches (up to 10 km for LR4), meeting the loss budget is now more challenging than ever before. Furthermore, CFP lasers are aging and need to be replaced. In response, the FTB‑5230S‑OCA features built-in configurations for 40GBASE-LR4 and 100GBASE-LR4/LR10 CFPs, ensuring quick and reliable power measurements at the touch of a button. Visit our website for more information about these solutions. Listed on the NASDAQ and TSX stock exchanges, EXFO is among the leading providers of next-generation test and service assurance solutions for wireline and wireless network operators and equipment manufacturers in the global telecommunications industry. The company offers innovative solutions for the development, installation, management and maintenance of converged, IP fixed and mobile networks—from the core to the edge. Key technologies supported include 3G, 4G/LTE, IMS, Ethernet, OTN, FTTx, VDSL2, ADSL2+ and various optical technologies accounting for more than 35% of the portable fiber-optic test market. EXFO has a staff of approximately 1600 people in 25 countries, supporting more than 2000 customers worldwide. For more information, visit www.EXFO.com and follow us on the EXFO Blog, Twitter, LinkedIn, Facebook, Google+ and YouTube.